Plus Size Summer Dresses, be they for work or casual dresses, sun dresses or a swimsuit cover-up dress will keep you cool and looking great when it is hot outside. Don't be afraid to get a little creative with your summer wardrobe. Find bold, unique dresses that you can wear with flip flops or heels. While summer dresses normally fall into a more casual category if you pick out one that's relatively plain you can “fancy” it up in a lot of different ways. Get a bright belt, some matching bangles and then hit the boardwalk with confidence. There is a great selection of women's plus size dresses for summer - the earlier you shop the better the selection. 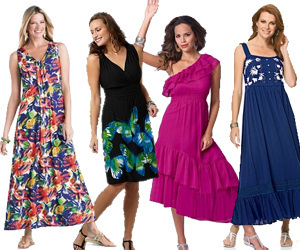 As the sun starts shining and warm breezes fill the air it's natural to start thinking about getting some fun and fashionable plus size summer dresses. This type of dress gives you the perfect opportunity to tune into your personal style sense and get a bit playful. There is absolutely no reason that you have to wear big, frumpy and hot clothing during ANY time of year, let alone a time when you want to enjoy a little freedom. While some plus size gurus will tell you that sticking with neutral plus size summer dresses in terms of color – forget all that! Yes, darker colors can be slimming but they can also hold in a lot of heat. Instead for the summer months consider going with hues that show off your eyes or match your skin tone nicely. If you're feeling really whimsical try a few dresses with patterns you enjoy. Now before you buy, ask yourself what asset you feel is your best. Legs? An hourglass waist? Cleavage? Neckline? When choosing plus size summer dresses look for the styles that naturally draw attention to that feature. This, in itself, naturally makes you feel more attractive because you're not focusing on the negatives. Avoid dresses that wrinkle or tug in all the wrong places. You want to be comfortable. Some of the most flattering styles for plus size gals include A-line dresses, slip dresses, empire lines, apron dresses and halters. One of the nicest things about summerware is that a lot of it is very affordable. That means the money you save on one or two pieces could be spent on a third that's a little higher quality. 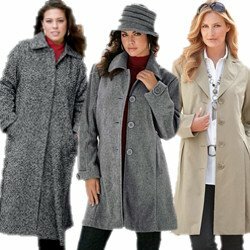 Generally a better made garment costs a bit more but it also holds up to ware and washing for a longer time.